Is Your Business Ready for Polymer Notes? OTTAWA, July 17, 2012 /CNW/ – Are you ready? More specifically, is your cash-handling equipment ready for polymer money? If your business uses automated banking machines (ABMs), vending machines, self-serve checkouts or cash counters, you’ll want to check that your equipment is compatible with polymer notes. It may need to be upgraded, or in some cases replaced. The Bank of Canada recommends that you call your equipment supplier or manufacturer with any questions about machine compatibility and plans for upgrades. The Bank also has tools to help you as Canada transitions to the new, more secure and more durable polymer notes. The Bank provides free bank note training seminars across the country. These presentations can be customized to suit your business needs and are occasionally presented in partnership with local police agencies. Topics include bank note security features, what to do with a suspected counterfeit, and how to handle polymer notes. Our free materials can help you start out on the right track. You can download or order the Bank’s full suite of products by visiting www.bankofcanada.ca/banknotes and following the link for Materials. They’re more secure, with leading-edge security features that are easy to check and hard to counterfeit. They’re very durable, lasting at least 2.5 times longer than paper notes and having a reduced impact on the environment. They’re easy to handle. Polymer notes feel different from their paper counterparts, but they’re just as simple to use. 1 888 513-8212To schedule an interview or to get more information on Canadian bank notes, please contact media relations at 613 782-8782 or email communications@bankofcanada.ca. “New Canadian Money” MONEY.CA says its gold! Our services may include daily market commentary sent to your e-mail address, and specific market investment advice over and through several financial sectors and any other important news, information and offers that will truly save you time and money. MONEY IN CANADA. Get Exclusive MONEY Membership benefits, privileges and information Sign Up Today! 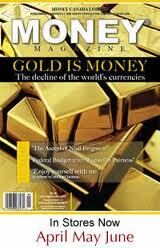 MONEY.ca Online and get MONEY Magazine to the desktop or doorstep it’s your next step in learning more about money. New Canadian Money!